This page hasn't been updated to the new format for this site. To get back to the previous page, press the browser's back button. This is not a review of the film Creep - rather, an analysis of the film's locations. I've never been a fan of slasher horror films (which Creep most definitely is). Suffice to say that the film has a reasonably scripted plot, some first rate body special effects, some great locations(!) but the story gets a little weaker towards the end as the plot appears to run out of ideas. It is quite obvious that a large percentage of the movie was filmed on location a few distinct locations on the London Underground, all of which are featured on this web site. Here is an analysis of some of these scenes, and where I can discern they were filmed, or where the Making Of Creep documentary, shown on Sky Mix states they were located. 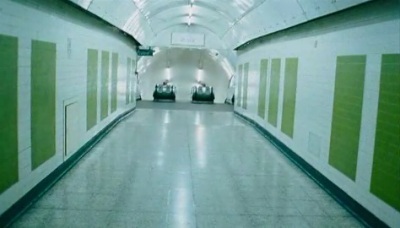 The documentary stated that London Underground filming took place over 3 weeks at the end of 2003. 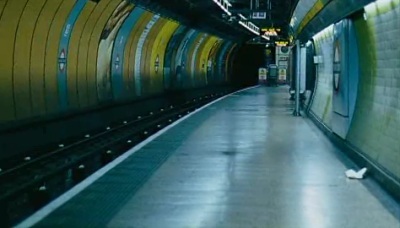 Starting with the blindingly obvious, the disused Jubilee Line platform at Charing Cross was used at the start of the film to represent the platform in Charing Cross where Kate falls asleep and misses the last train, and later tries to get the attention of the guard. 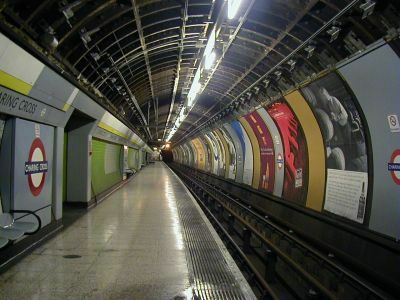 The Jubilee Line Platform at Charing Cross as seen in June 2001. This is of course an ideal choice because very little if no set decoration was required. It looked identical to when I visited despite the fact that some of the posters on the platform had been updated (probably for the film). The main concourse was also used in many scenes. As with the platform, the only set dressing required was the installation of recent posters - the concourse was bare of posters when I visited. This section included the corridor with the little hatch into the room where the homeless couple lived (something that would never be found on the actual station - imagine the security risk?!). The hatch is real, but the room beyond I suspect was a studio set. The actual concourse and interconnection tunnels were also used in some scenes - presumably they filmed these in the small hours of the morning when the station was closed to passengers. I think the majority of scenes not filmed at Charing Cross were filmed at Aldwych. There are several different scenes that represent different locations that can be identified - either by sight or from the documentary. 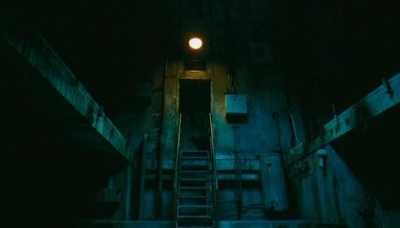 The lift shaft appears in several scenes - notably where the Creep feeds the rats and where he's dragging a body over a short bridge. The space behind the lift shafts was also used, presumably because of its bare, derelict look. The bridge, over which the Creep dangles and feeds the rats, and the area behind the lift shafts. In one scene, Craig (the homeless guy) is seen running into Aldwych's main running platform, thinly disguised as Charing Cross. It's obviously Aldwych though - it has Aldwych's unique tile pattern. I have seen this corner also disguised as Mornington Crescent (for the film Honest) and also with the outline of an original shaped roundel (since removed). The north end of the Working Platform at Aldwych. Here's where the film makers have taken some creative licence - the far end of the disused platform had been re-modelled and dressed to look like Down Street. Ok, it didn't actually look anything like Down Street - but that was its identity in the film. A Down Street roundel had been placed on the wall and a convincing looking old style signal box had been placed in the location originally occupied by the Holborn mockup that I had seen when I visited the platform (probably indicating that the mockup is no longer there). The actual Down Street station was not used as a filming location, despite claims to the contrary by The Times. London Underground no longer allow access to this location to anyone without operational reason to do so, for health and safety reasons. 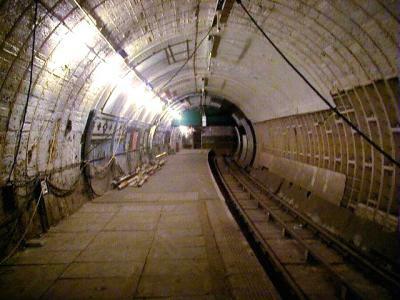 The Disused Platform and the Holborn mockup. 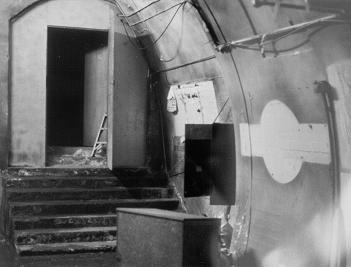 The doorway can be seen in the distance on the picture above and leads into some interconnection tunnels that were never completed and a short 4 metre stretch of platform. 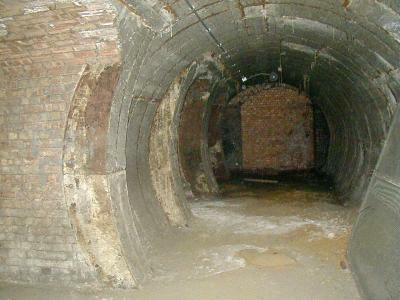 It was revealed in the documentary that the scene where the main characters discover a hole in the cast iron tunnel wall and go through it was filmed here. A false tunnel wall was built for this purpose. In reality, the area is actually the end of the platform - the wall forms a false end to the platform area to cover the unfinished staircase that leads into the interconnection tunnels. 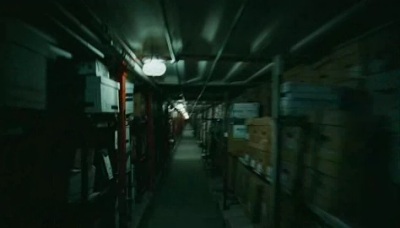 One of the chase sequences shows Kate running down a tunnel lined with hundreds of cardboard boxes. This looks very much like Belsize Park's deep level tunnels, which form part of the never completed Northern Line express route, used as air raid shelters during the Second World War. 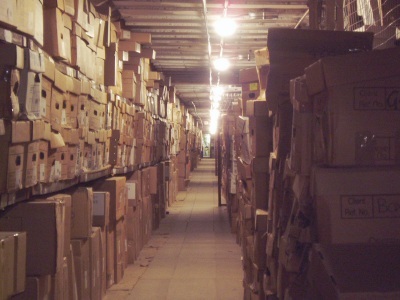 Today, these tunnels are used for document storage, hence the cardboard boxes. Update: [2nd December 2005] Having now got the film on DVD, I now have doubts about it being Belsize Park - I now think that the location used for this sequence was Camden Town deep level shelter, because of a single freeze frame of a sign saying "Exit to Underhill St.". I guess more than one of these deep level shelters are being used to store literally miles of cardboard boxes for legal puropses! 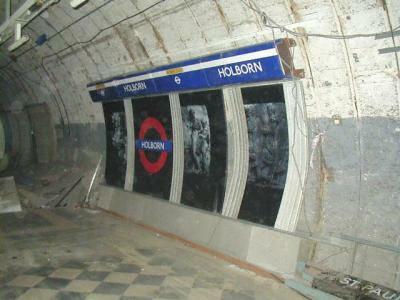 The Disused Platform and the Holborn mockup. In this picture, the roof appears flat, whereas in the film's trailer, the roof is curved. This is explained by my photograph being taken in the lower deck of the shelter, whereas the filming took place in the upper deck. According to the documentary, some scenes were created in studio mock-ups, which were created in an abandoned factory in Germany. These include most of the "sewer" sequences, including the "cage tank room" and the sluice that Kate slides down. I'm sure other scenes including some of the tunnels were created in such locations as well. Much of this section was originally written before I saw the film so some paragraphs repeat information already given above. The film's poster features the front of an Underground Train. The front driver's door is opaque, but there is the image of a blood stained hand on it. This poster was apparently banned from display by London Underground as they feared it would unsettle passengers. When I got home, I looked the film up on IMDB, and through this found a trailer. 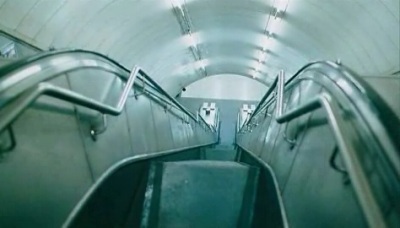 The trailer opens on an eerie shot of a deserted corridor leading to a set of escalators. This was filmed at the top of the escalators leading down to the now abandoned Jubilee Line platforms at Charing Cross. There are two directions from which you can approach the platform - this was filmed from the Bakerloo Line end of the concourse, since this has a longer passage leading to the escalators. 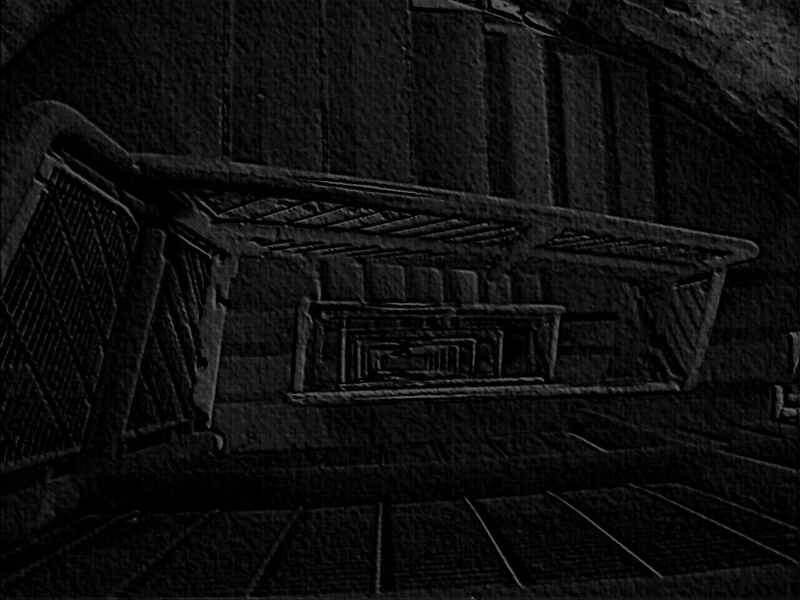 The trailer continues with a shot looking down the escalators - these are the same escalators seen in the first image. 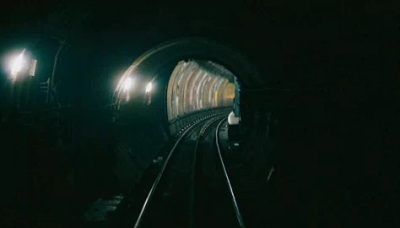 There are several scenes that are clearly shot on the Jubliee Line platforms at Charing Cross. No attempt has been made to disguise the location as another station or being on another line and the platforms look almost exactly the same as when I visited. Mystery location. I doubt whether a set was built for this location so it is probable that it was filmed somewhere on the Underground. Update: It has since been established by the Making of Creep" documentary that this was filmed on a sound stage in an abandoed factory in Germany. Next, this was taken in the running tunnel looking into Charing Cross. By the height and location of the camera, I suspect this was taken from the driver's front door, which was probably opened especially so that this image could be taken. I took a similar photograph near to Holborn's Aldwych platform, showing the cross-over. Two types of rolling stock can be seen in the trailer. Here we see 1972 rolling stock. I believe this stock is no longer in regular service on the London Underground and I suspect that it is highly likely to be the same train that I saw that's kept at Aldwych for the use of filming companies. 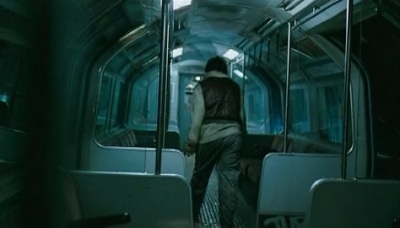 Here, more modern rolling stock is seen - probably a Jubilee Line train hired for the sequences filmed at Charing Cross. A swift jump to a completely different location, where the main character, Kate [Franka Potente - Run Lola Run, The Bourne Identity] is being chased down a tunnel lined by cardboard boxes. This is definitely filmed in a Deep Level Shelter. Since several of these are now in use for document storage (and this one is evidently one of those) it could be any one of these - but I must say this one looks remarkably similar to the one I visited at Belsize Park. 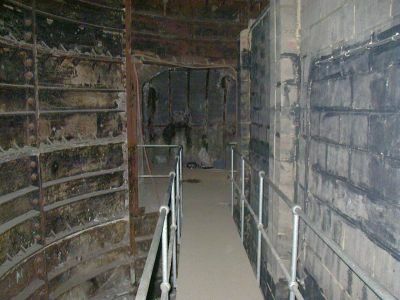 Again, in a Deep Level Shelter, this image shows the characteristic flat roof of the lower deck of the shelter. This is the only part of the trailer that shows an extract of a platform at Aldwych, which is quite surprising as quite a few scenes were filmed there. This picture has been taken from the short over-run just beyond the end of the platform (not the tunnel that runs to Holborn). Evidence for this is that the platform walls are decorated with tiles. The other one is quite bare, not having been decorated and can be seen in an otherwise similar photograph on the Aldwych page. 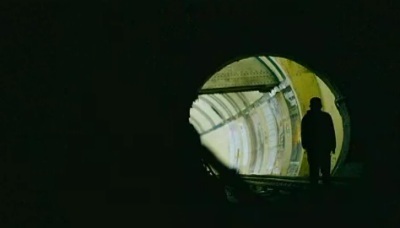 This is another scene that's filmed in the tunnel that runs between Aldwych and Holborn. It's a very short scene in the trailer and initially I thought that the train was moving towards Kate but looking at the scene frame by frame, the train's door can be seen opening and a shadowy figure is observed coming into view before the scene jumps to another sequence. Understandably, a film of this nature has been given an 18 certificate in the UK and contains several quite shocking scenes. Apparently, the director Christopher Smith nearly electrocuted during the filming of the movie when he accidentally stepped on a rail that was supposed to be dead but apparently still had a residual electrical charge. The film was released in the UK on 28th January 2005. Note: If you were directed here by a search engine you may not have the Navigator Frame turned on (down the left hand side of the screen), which is designed to make finding your way around this site easier. If not, then click on the icon below. All textual material on this page is © 2004, Hywel Williams, all rights reserved. The film is distributed in the United Kingdom by Path� and as such, all images on this page that are taken from the film's trailer are attributed to them. Note that the film may be distributed by a different company outside the UK.